I posted this status update on FaceBook yesterday, and tagged my mom hoping she'd get a laugh out of it. My brother commented and my friends commented, but I never heard a peep out of my mom. I forgot all about the post and sent her a text later that night letting her know I'd be running today in Livermore. I wanted to spend time with her and my dad, and also needed to drop off some fresh coffee and the new Juanes CD. I never heard back from her, and finally I fell asleep. What could be so delicious, you ask? 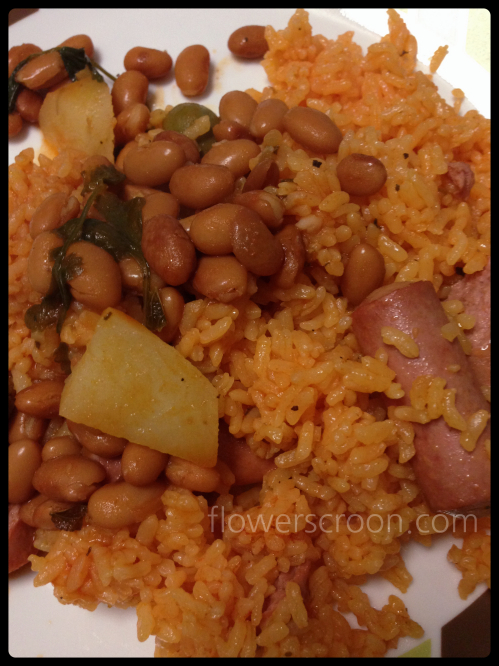 Translated, arroz con salchichas y habichuelas guisadas means "rice with sausages and stewed beans", but it is so much more than that. This classic Puerto Rican dish starts off in a big pot with sofrito. Sofrito, made with puréed fresh peppers, onions, tomatoes, garlic, and cilantro, is a tasty base used in most latin dishes. A little oil, tomato sauce, a packet of Sazon, olives and sausages are then added to the pot just before the rice. Then, the pot is topped with water, and somehow (magically) this rice cooks without being sticky or without clumping together. Similarly, the beans begin with the sofrito base, oil, tomato sauce and 1 packet of Sazon. After that sautés for a bit, the beans and potatoes are added. Each pot cooks for about 20 minutes and the end result is heaven. I wish I could tell you how cook it perfectly, I really do. But, if I knew how to make it, I wouldn't need to beg my mom to cook it. El Boricua does have recipes listed for both of these dishes, but I can't vouch for their flavor. Your best bet is just be nice and ask me if you can crash dinner at my mom's sometime. In the meantime, I am gonna pray that I learn to cook like her. Spending a little bit of time with parents this afternoon was perfect. It was nice to talk to them alone, without my daughter nearby, because it gave us an opportunity to talk about my dad's condition openly. He looks good. The chemotherapy has caused his skin to break out in a fiery red rash, and he is constantly sick to his stomach. But, he eats anyway. Apparently, chemo has not robbed my dad of his appetite. My mom says he eats like a horse and has gained weight. Watching him clean his plate was hilarious. That stupid cancer finally gave us something to laugh about. In our culture, in my family, a good meal is never more than a status update away.